An excellent game at el Madrigal with both sides contributing to an engrossing contest. Marcelinho made just one change from the side that had swept away Osasuna in their last game with Dos Santos replacing Perbet in attack. Villarreal began with their usual 4-4-2 formation. Cani would tuck into central midfield from his left side starting position. With a number of injuries to contend with, Ancelotti went with Carvajal and Nacho in the full back positions. Despite not being fully fit, both Isco and Bale started for Madrid with Illarramendi making his Madrid debut too. After all the conjecture about where Bale would play, he began life at Real Madrid in the right wing in a 4-2-3-1 system. The attacking trident of Ronaldo, Isco and Bale may appear devastating on paper but at el Madrigal, things were anything but. By contrast, Villarreal enjoyed greater balance and movement across the pitch aided by a degree of familiarity and understanding in their play. Both full backs pushed very high especially Mario to support Aquino and push Nacho further back. 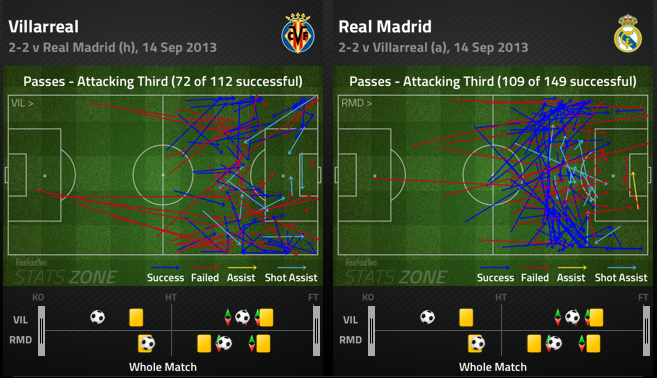 Early on, much of Villarreal’s play was coming down the Madrid left. 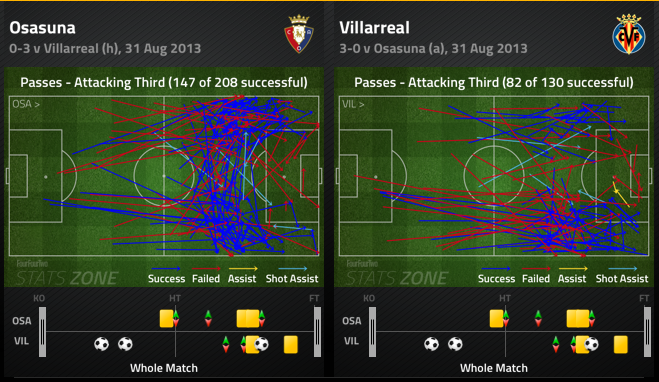 The key aspect of Villarreal’s play was the combined with fluid movement and sharp passing. In Pereira and Dos Santos, the Submarine had two forwards willing to work the channels between centre back and full backs to great effect. Overarching all of this was a clear understanding of what they wanted to achieve. Swift, purposeful moves forward aided by sharp first touch passing with options provided from the second line of attack. Madrid received plenty of warnings yet failed to heed any of them. Pereira should have opened the scoring after 5 minutes when Pepe failed to cut out a Cani pass on his outside but his weak shot was deflected wide. The Villarreal midfield closed down Madrid quickly early on such as Trigueros robbing Isco after 7 minutes letting the home side break. It set the tone for the game. 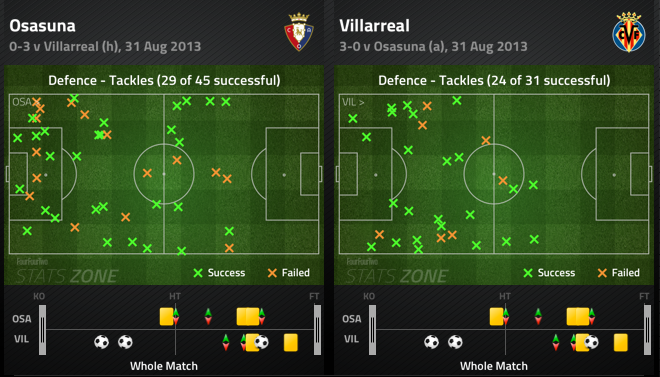 Villarreal broke quickly and directly but the forwards were adequately supported from the second line of attack. Cani got into the penalty area to open the scoring after 21 minutes with the move being instigated down the channel between Ramos and Nacho. There were also further chances for Aquino, again driving down the inside right channel, and even left back Costa arrived in the penalty area unmarked. Madrid were physically off the pace and mentally too were lacking. A quick corner in the 13th minute was delivered to the unmarked Pereira at the back post but Lopez saved the resultant shot. The runners from midfield repeatedly caused problems for Madrid as they went untracked whilst the pairing of Ramos and Pepe looked unsteady. 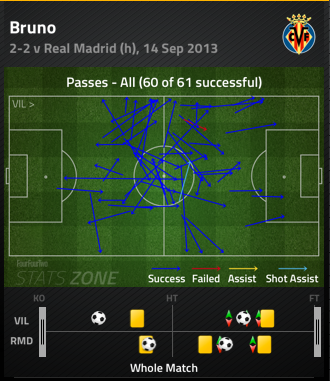 And at the heart of Villarreal’s play orchestrating things was the highly impressive Bruno. On a night when the press had gathered to see Gareth Bale make a goal scoring debut for Madrid, it’s a fair assessment to say that Bruno was the best performer on the pitch. Bruno remained with the submarine when they were relegated and he may never receive the move to a bigger, more prestigious club despite reports of numerous suitors throughout his career. He may never add to his four Spanish international caps either but he showed on Saturday evening just what he is capable of and why both he and Villarreal will be an asset to La Liga this season. 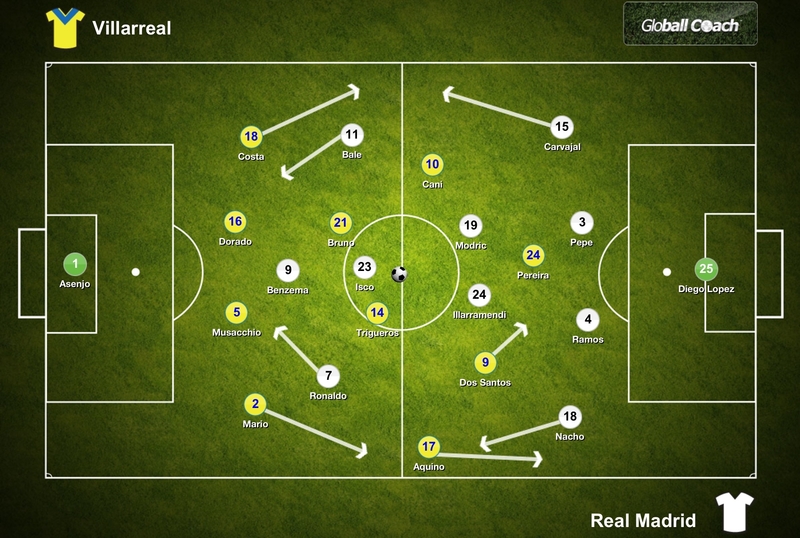 If Villarreal are clear what they aim to achieve on the pitch, Ancelotti is still working on that element for Madrid. The Italian has repeatedly shoehorned various star players into a starting line up over his career and he will need to repeat the trick again at Madrid. The front three of Ronaldo, Isco and Bale will have many running out of superlatives to describe them but there’s a worry for Madridista’s that the balance is not right. Ronaldo doesn’t track back but the side could compensate with the workrate of Di Maria on the right but if Bale replaces the Argentinean in the starting eleven and drifts further inward, there will be issues for Madrid during transitions as Villarreal showed on Saturday. Modric and Illarramendi were overrun at times as the Submarine swarmed forward at pace. There was also the problem on occasion of both central midfield players moving forward together with nobody staying deeper to offer defensive protection. 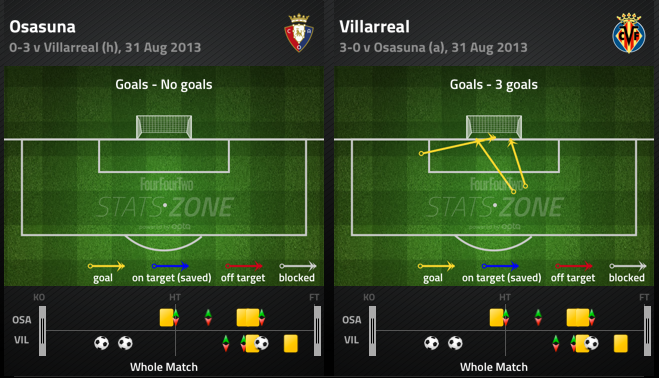 The second goal for Villarreal arrived because nobody bothered to close down Cani as he ran forward in a central area. Lopez saved his shot but Dos Santos converted the rebound. As poor as that was, earlier in the move, Bruno and Musacchio exchanged passes with Di Maria closing them down whilst the remainder of the Madrid team sat back. One player pressing alone is a total waste of time. It was a difficult evening for Nacho and Carvajal at full back and whilst Nacho may lack the attacking thrust that Marcelo presents, the work of Carvajal on the right collecting a pass from Modric before cutting back for Bale to score shows the greater penetration that he offers over the more conservative Arbeloa. Villarreal failed with over a third of their final third passes but with a riskier strategy of threading balls into the channels to get behind Madrid, this was always a more likely outcome. 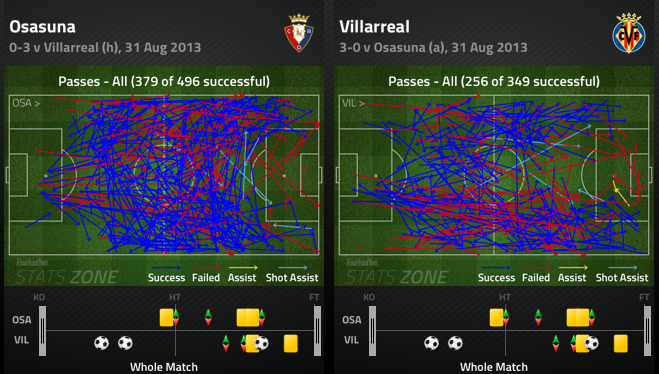 The graphic also shows how a number of passes which led to shots came down the Madrid left. The plan was clear. Shift the ball quickly and try to exploit the gaps behind Madrid with pace whereas Madrid were disjointed in attack due to a lack of familiarity with each other and a lack of fitness for key players. Madrid seldom got in behind Villarreal’s defence and with Benzema dropping deep, it was another example of the visitors always playing in front of their opponents defence. The equalising goal for Madrid was one of the few times they got behind Villarreal. Benzema was involved in Madrid’s second when his shot was partly saved by Asenjo but the goal was really about the craft of Isco, juggling the ball out of danger before Ronaldo carried possession forward. The front four of the team possess tremendous individual ability. The trick for Ancelotti will be gaining the best from them collectively. Ancelotti will be satisfied and relieved with a point. Playing Bale and Isco whilst not fully fit and handing a debut to Illarramendi nearly backfired but to gain a point and aid team development and player fitness, it will now seem worthwhile. An excellent point for Marcelinho and Villarreal but the thought will linger that it should have been three and that this may actually have been an opportunity lost. The Submarine created and squandered numerous chances as they attacked with precision throughout. Four games in and Villarreal are undefeated with ten points. The challenge is to maintain this level of form and begin the process of re-establishing the Submarine back amidst the upper echelons of La Liga.